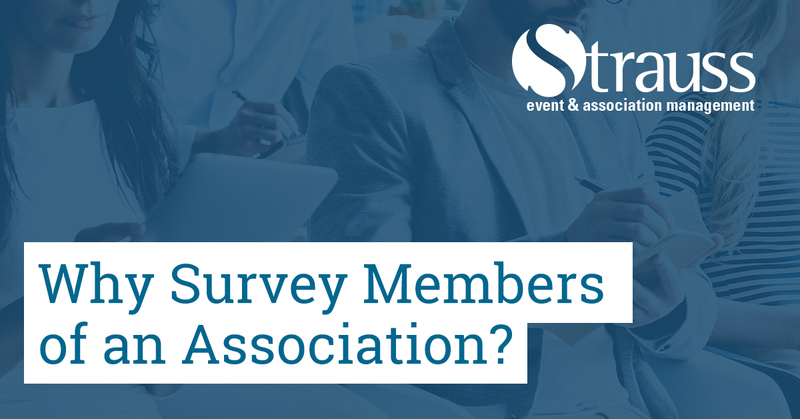 Why Survey Members of an Association? Members are the lifeblood of associations. Without members, an association would cease to exist. An association’s members are its most valuable asset and bring the life, the drive, and the mission to associations. An association depends on a strong membership to ensure its continued success; therefore, it is important to confirm that the members are satisfied with the services provided, and feel that their profession or trade is being well-represented. Member satisfaction surveys can be employed to provide members with a voice and to ensure the association continues to exceed their expectations. In this article, I will introduce you to the What, Who, Where, When, and Why of member surveying. What is an Association Member Satisfaction Survey? A survey is a tool that poses a series of questions to a desired audience in order to determine their thoughts or gain understanding on members’ perspectives on a subject. For an association management company, surveys are a valuable way to communicate with members to become more knowledgeable on what members want and need. Surveys are a tool that can help to ensure that the membership is satisfied with the level of service they receive from the association, and the association can use these results to adapt services to meet the needs of members and remain strong amongst competition. Who Should Association Member Satisfaction Surveys be Directed to? Surveys can be prepared for the entire membership or can be created for specific target groups. These groups can include the board of directors, committees, chapters or can be based on where members are located. When a survey is sent to all members of the association, the questions can pertain to association-wide incentives and services. When surveys are created for smaller groups within the membership, questions can be specific to the group type. For instance, surveys for committees can include questions related to projects or agenda items, while surveys for members who live in certain areas of the country can touch on regional topics that affect the association. What Tools can Association Staff Use to Create Surveys? There are many different survey platforms that exist which can be used to create a survey. The one you decide to use will be dependent on the size of the group and purpose of the survey. Google Forms is a free online service that is user-friendly. Users are able to select the colour template and personalize the layout by adding the association’s logo. Google also allows users to customize the look of the survey, and ask questions in different formats including multiple choice, short or long answer, and scale-based questions. This platform is perfect for both small and large groups. Doodle is a great tool for scheduling a meeting for a group of members. The organizer can select a number of dates on a calendar and offer specific times for each date to the invitees. This survey aids in meeting-planning as it replaces the back and forth emailing that occurs when trying to schedule a meeting for a number of members. This platform works best for smaller groups. Besides Google Forms and Doodle, a third-party company can be contracted to manage the survey process. This is a great choice for presenting a more professional, wider-scope survey for a large group. This option should be considered if your survey is intended for the entire membership. It is a costly option due to the construction of the survey, and the detailed report provided afterwards. Other survey platforms worth looking into are QuestionPro and Survey Monkey. For more information on online tools, visit my blog article Connection with Association Members Using Online Tools. Why should an Association Prepare a Member Satisfaction Survey? It is important for association management companies to regularly prepare surveys for members to ensure that they are satisfied with the services the association is providing. As part of an association, members are usually offered perks and incentives. Without checking in with the members, how are association management companies able to know that the services provided are exceeding member expectations? By asking members their perspectives and opinions, you will have a good idea if the services provided are well-received. Associations should be constantly evolving to provide exceptional service to its members. Two-way communication with members is a great way to test the waters before introducing members to a new idea or incentive. A survey can be utilized to ensure member satisfaction, and it can be a way for association management staff to learn more about the members. Information obtained from these kinds of surveys can be used to improve the services and types of memberships available. When should Association Member Satisfaction Surveys be Delivered? Delivery of communication to members can determine the response rate. There are a couple of things to be considered, such as day of the week, time of day, and other correspondence being sent by the association. The survey should be delivered at a time that maximizes receipt and readability. This is especially important if the survey is time sensitive. First thing in the morning and the hours surrounding lunchtime are good times to schedule your communications. If the survey relates to feedback of an event, it is imperative that members receive the communication immediately after the event concludes, because they will likely be more responsive with the experience still fresh in their minds. Surveys for this purpose should be prepped and ready to be distributed before the event starts and scheduled for delivery when the event ends. Surveys are invaluable tools that should never be overlooked. As a two-way communication tool, associations can take advantage of communication from members. The association has the avenue to learn about members’ desires and expectations, which, when implemented, can take the association to the next level. This can provide exceptional service for existing members and can ultimately attract new members. Engaging your members in communication will provide valuable information to association leadership. Association member satisfaction surveys are an affordable and inclusive option that all associations should use. A Joint Venture Between Two Associations – Creating A Mutually Beneficial Partnership.